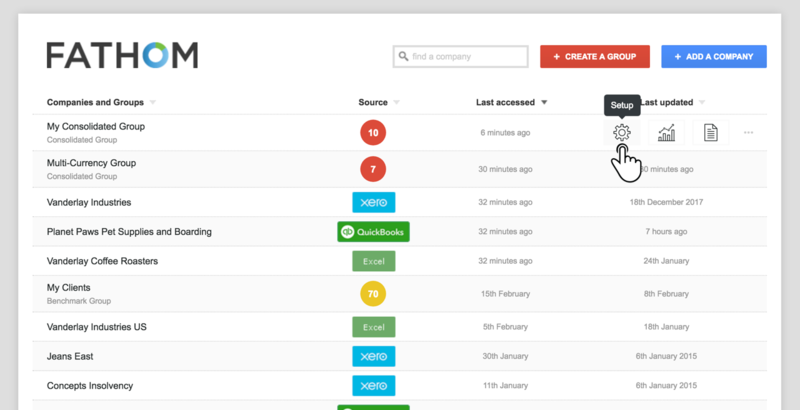 Fathom enables you to group related companies and easily create consolidated reports. These features enable you to create an aggregated view of both the financial and non-financial performance of a group of companies. Fathom will consolidate financial results by unifying accounts with the same name and Fathom classification. Accounts from different companies that have these two elements in common will appear as a single account in the consolidated group and any associated amounts will be summed accordingly. First, ensure that you have imported each entity into Fathom. 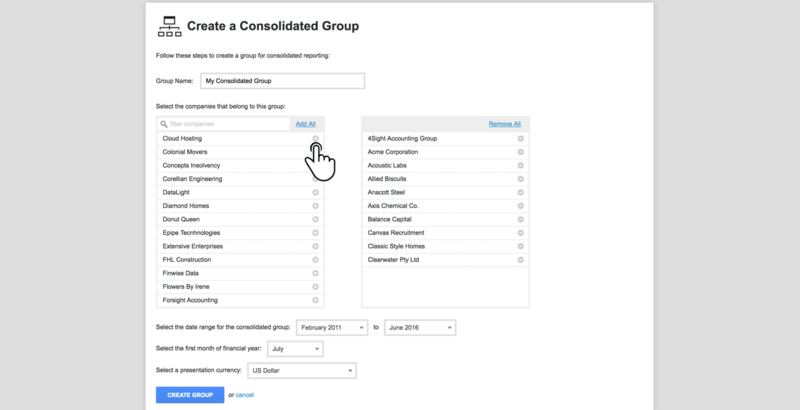 After all companies are imported, in the ‘My Companies’ screen select to 'Create a group' and select 'Create a consolidated group'. Select which companies you wish to include in the group by clicking the '+' button next to a company. You can also specify a name for the group, and choose a period range for analysis. If the chosen companies operate using different financial years, you will need to choose a first month of financial year to use for the group. Note: For multi-currency consolidations, please see Multi-Currency consolidations. When you have finished selecting the companies to include in the group, click ‘Create Group’. Access the group setup by clicking the 'Setup' icon in the My Companies screen. In setup, you can review important settings (i.e. KPIs, targets and alerts) for the group. You can also add or remove companies from the group, by selecting ‘manage group’ in Step 1 of the 'Setup'. Once you have initiated the consolidation, it is recommended that you review the KPIs, targets and alerts for the group in Steps 4-6 of the Set Up. A KPI cannot be created directly within a consolidated group. It must be created in one of the underlying companies and then it will show once a consolidation update has taken place. However, not all KPIs will be used. Only custom KPIs which have been created in the KPI Library and added to one of the underlying companies will be included. Custom KPIs belonging to a single company will be ignored during the consolidation process. 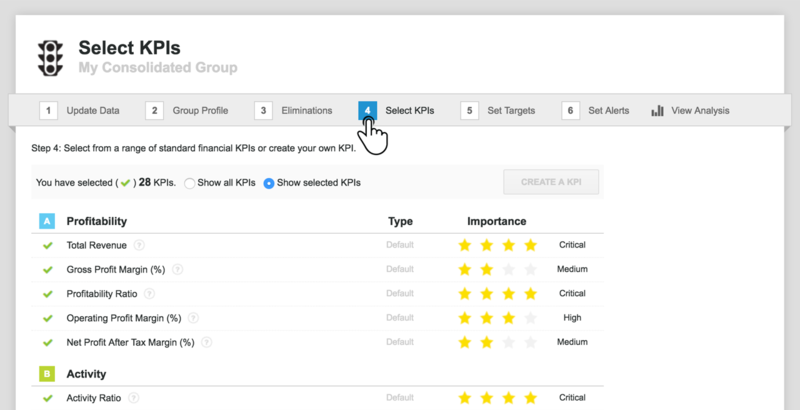 You can set targets for each of the KPIs. For a step-by-step guide to the consolidation process, see: Guide to Consolidations in Fathom. The following articles provide further information that could be helpful: Eliminations, Analysis in a Consolidated Group, Consolidated Reports, Updating a Consolidated Group.